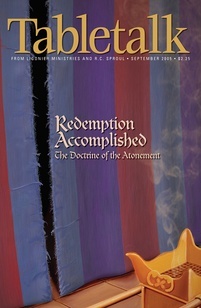 The idea of propitiation is central to the atonement. We learned yesterday that God is a just and holy God and therefore must punish sin. But God also loves His people and desires to be in relationship with them. In order that God’s love and justice might both be satisfied, the wrath of God against our sin must be placated; this happened in the atonement. On the cross, the sins of God’s people were imputed to Jesus and He bore the full wrath of God that is due them. This wrath having been satisfied, God can now be favorable, or propitious, to His people. His love provided a way for His wrath to be satisfied so that we might be reckoned as righteous in His sight and enjoy fellowship with Him (Rom. 3:21–26). John teaches that this propitiation is not only for us but is also for the whole world (1 John 2:2). But if Christ has satisfied the wrath of God for the whole world, then is the whole world going to be saved? Many passages of Scripture make it clear that this cannot be the case (for example, Rev. 21:8). What 1 John 2:2 is telling us is that Jesus is the only Savior of the world; that is, He is the only way anyone can be saved no matter who he is (John 14:6). Jesus died to save a people out of every nation; in that sense, He is the propitiation for the whole world Nevertheless, this does not mean that He died for every individual who has ever lived. Jesus’ death benefits only those who trust in Him, for only those who serve Him in faith receive cleansing from Him (1 John 1:7). This does not make the efficacy of the atonement dependent on us, however. Jesus does not offer a potential atonement for all that we make effectual by our believing; rather, He offers an effectual atonement for His people, which cleanses them, and only them, from their unrighteousness. John simply reminds us in 2:2 that Jesus is the only way for anyone to be saved, not that the atonement is universal. Scripture’s emphasis on God’s desire to save His people shows us that the atonement was designed to pay fully for all of the sins of the elect. Two thousand years ago, Jesus paid for the sins of His people. This great truth should cause us to burst forth in praise of His particular love for us. It should also make us confident when evangelizing, for it means there are people out there who have been bought and will confess faith. Share your faith with a non-believer today.